The workshop and the trainer were good! Dammam has demonstrated the fastest economic growth in Saudi Arabia. Oil and natural gases are the main contributors to the economy of the city. In a swiftly expanding global market, new cities and developing economies come into play as major economic hubs; Dammam is one such city in the Middle East. In an attempt to diversify the economy from oil, Dammam is open to establishing new corporate ventures as demonstrated by the rapidly growing economy. IT companies have been on the rise and the demand for trained IT professionals created by an ever-expanding employment market has made Dammam a favorite destination for individuals seeking a challenging working environment. Professionals are constantly required to update themselves in their chosen specialty to stay relevant in the field. KnowledgeHut has developed e-learning modules for such purposes, including the CSD Certification in Dammam. The scrum framework is increasingly popular in global work places and certified scrum developers remain in constant demand by prominent companies. Dammam is ideal for establishing new business centers of global companies and new IT start-ups, which has created a dynamic work environment. The CSD Training in Dammam is suited for entry-level and mid-level professionals seeking to upgrade their professional repertoire in their chosen expertise. The skill-building certification provided by KnowledgeHut will definitely augment the skill-set of candidates and transform them into a valuable asset of their organizations. Enrolling in online classes in Certified Scrum Developer Training in Dammam will ensure that our candidates are employment-ready on graduation and save valuable resources that would have otherwise been spent on training by their employers. The CSD Training in Dammam from KnowledgeHut comes with expert faculty and online resources that can be accessed by students easily. 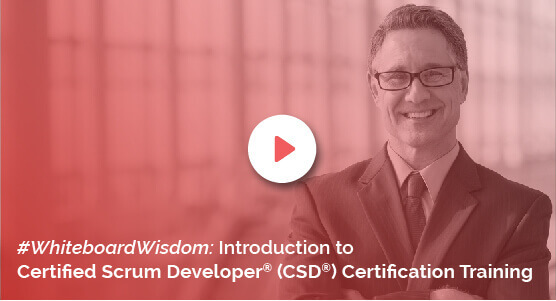 The Certified Scrum Developer Certification guarantees that you have a competitive edge over your competition by virtue of your enhanced knowledge and skill set at a reasonable price. The world-class training from KnowledgeHut ensures that you are able to pass the exams on this subject with relative ease. Online training in CSD Course in Dammam will increase your employability and is definitely worth the investment.